He hails from Jersey and has a good ol’ Catholic name – Frankie. He exemplifies an epic fearlessness and relentlessness, boasts an unbelievable ability to roar back from severe punishment, and has earned spectacular success despite being grossly undersized for his weight class – reminding me of a modern-day MMA version of Rocky Marciano. To top it all off, two of his favorite foods are pizza and pasta. Do you see where I’m headed with all this? 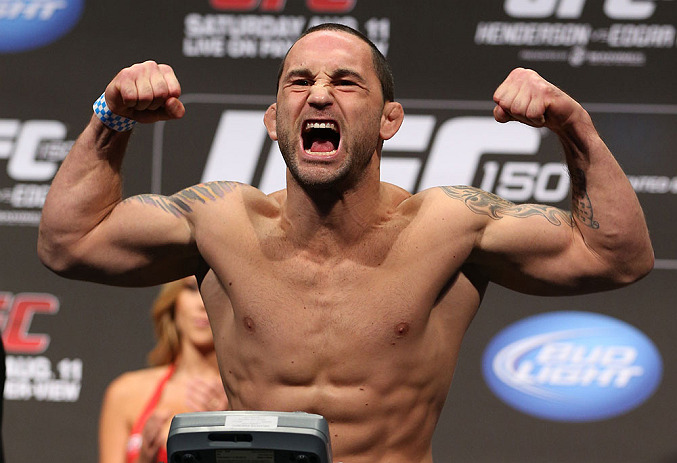 Instinctively, I had always suspected that Frankie Edgar was a product of Italian ancestry. Everything about the former UFC lightweight champ sparked my suspicion that he had ties to Italy. With one exception: His last name. The lack of vowels rolling off the tongue threw me off. Eager to hear from Edgar, I recently caught up with the 31-year-old Clarion University grad and he finally set the record straight on his bloodline. Case solved. Still unknown, however, is the exact date and event where Edgar will make his featherweight debut against 145-pound kingpin Jose Aldo. “The Answer” talked with me about cutting weight and his bid to crash the elite list of UFC fighters to win a title in different weight classes. Frankie: Not too much is different. Right now I’m walking around at probably 160, 162. I’m still smaller than most 145 pounders. I’m training twice a day but not super-hard. The intensity isn’t there like it will be when I have a date and I’m in training camp for the fight. If I’m training for a fight I’m beating my body up a lot. This will be my seventh title fight in a row so in between fights it’s important to pull back and focus more on technique and getting better. So when I’m training, in between rounds I must rest more than usual. As far as weight-cutting, I just eat when I’m hungry. That’s about it. I try to eat clean but I don’t have a strict diet going. By the time training camp comes I’ll probably be within 10 pounds (of making 145). It’ll just be water weight. I don’t really have to cut weight. The week of the fight I will work out to get the weight off. I don’t like starving myself. I’m not into that. I like to eat some pasta and carbs. But during training camp I don’t eat as much pasta. It’s more brown rice. When I do eat pasta, my wife will make me multi-grain pasta. It doesn’t taste bad. We have a garden in the backyard and grow our own tomatoes. So my wife actually homemakes the spaghetti sauce from those organic tomatoes. I eat a lot of chicken, brown rice and avocado. For breakfast I’m usually eating oatmeal because it’s quick and easy. My wife cooks. I don’t cook – I eat. I don’t have a dietician or anything like that. I’ve just learned about nutrition from coaches, teammates and from being a wrestler (in high school and college). My wife is into eating healthy. She always reads up on organic and superfoods and stuff like that. She makes me shakes with hemp seed, kale and acai. If it wasn’t for her, I don’t know how much I’d be into that stuff. I was doing good at 155, so I didn’t get why people were asking for me to drop. Part of me didn’t want to drop because I felt like I always had that option in my back pocket if I needed it. Now that I’ve had two close calls at 155 and no wins, now is a good time to do something different. He’s got tremendous explosiveness and athleticism. That will the biggest adjustment for me. It’s going to be a good challenge. I’m sponsored by Gaspari Nutrition. I heard some people say that I looked a little bigger in my last fight. It’s probably from the Gaspari protein shakes. I take one a day, sometimes two if I feel I need some extra energy in between workouts. They’ve got amino acids and glycogen recovery without all the high fructose corn syrup you find in other products. I’m from Jersey, so pizza is my favorite food. My boxing coach, Mark Henry, owns Pino’s Pizza in Woodbridge. It’s some of the best pizza in all of New Jersey. My favorite is called “Upside Down Pizza.’ It has cheese on the bottom and sauce on top on a thin crust. I don’t get to eat it often, though. Luckily I live an hour away from Woodbridge!